When I say I’m going to a fossil festival, the reaction of friends who aren’t natural history geeks is often somewhat quizzical. It’s not exactly Glastonbury, is it? But I would argue that those of us who care passionately about museum collections, and return to Lyme Regis every year, are just as rock ‘n’ roll as the line-up at Glastonbury. 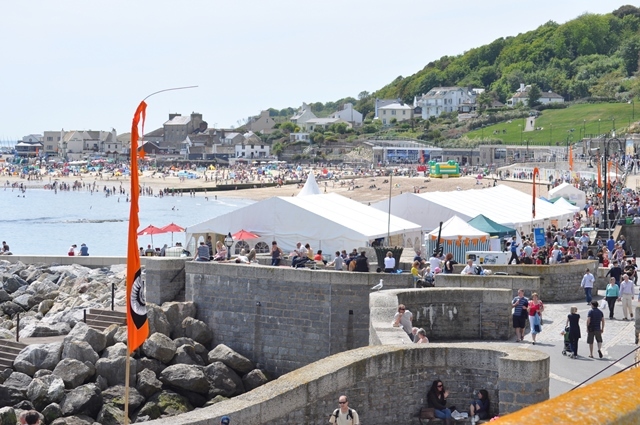 Lyme Regis Fossil Festival is one of the most successful examples of collections advocacy that I have seen, and it meets a wide variety of audiences over four days, working with Primary and Secondary schools and the general public. The fossil festival this year celebrated its 10th anniversary, and I wanted to share some examples of the good practice I’ve seen. Museums are just history, right? Luanne Meehitiya from Birmingham Museums reminded us, in her collections advocacy summary at the 2014 NatSCA conference, that the public may perceive museums as places of history, not as custodians of scientifically and culturally important collections. The surge in social media and targeted events means visitors are increasingly aware of the scientific research that takes place in museums. The Natural History Museum (NHM) and other regional museums presenting at Lyme Regis can engage audiences who don’t visit them regularly, or who see museums as simply about preserving history. Prof. Paul Smith from Oxford University Museums also emphasised that natural science and historical collections can and should contribute to 21st century debates within society. 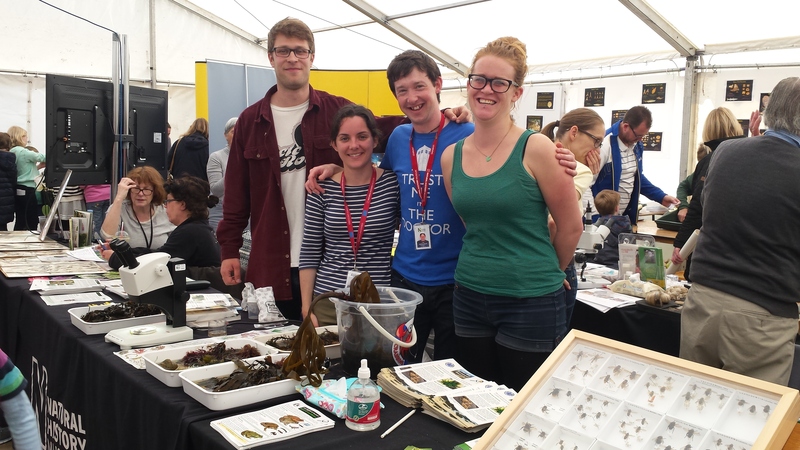 The fossil festival doesn’t just celebrate palaeontology, and the Life Sciences team have a strong presence at Lyme, actively engaging the public with research that contributes to debates around climate change, invasive species, and the loss of biodiversity. Myself and colleagues from the Angela Marmont Centre for UK Biodiversity spent time talking about a new citizen science project called ‘Orchid Observers’, which inspires visitors to look for 29 of the 56 species of orchids in the UK. By encouraging the public to record their sightings, we hope to build a dataset to see how orchids are adapting to climate change, and how this is affecting flowering times. Using original herbarium sheets, we explained how the problems of over-collecting and environmental degradation have contributed to the decline of orchids. What do people in museums actually do? The fossil festival is great at highlighting the amazing work of curators, researchers and scientists, and promotes careers in the museum sector. 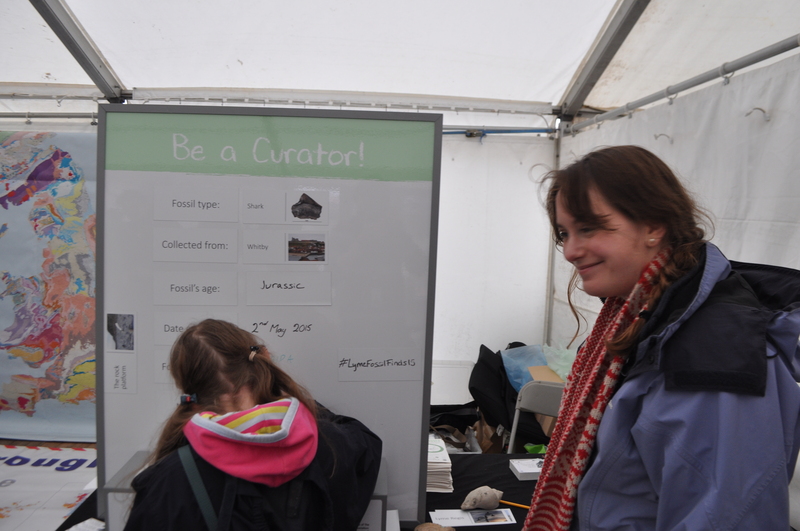 An excellent example this year was Luanne and Isla Gladstone’s ‘Be A Curator’ activity, where visitors chose a specimen and then had to label it with the age, locality, date, and scientific name. Not only do young people get to meet real curators, they gain an understanding of their work too! How can we learn more about museum specimens? Alex Ball from the Imaging and Analysis Centre at NHM probably has the coolest job I know. He spends his days using chemical, CT, and other scanning technologies to explore natural history specimens. 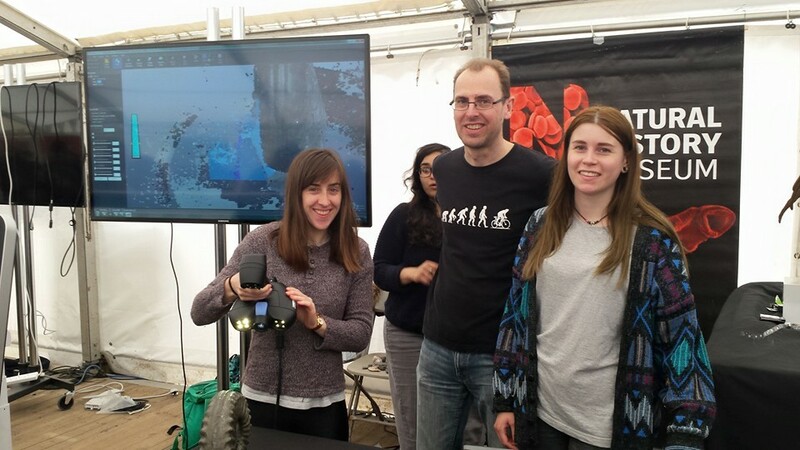 Alex is a continual presence at the festival, and this year he was using a structured light 3D scanner to scan museum specimens for visitors. It scans the object with several cameras and constructs a 3D model that can be examined from different angles. CT-scanned museum objects were also displayed on screens for visitors to investigate. This technology has enabled conservators to better conserve the beautiful Blaschka glass models, because they can understand how they were made. Researchers can also learn a wealth of information – from the morphology of mummified cats to the structure of meteorites – in a way that is non-invasive and keeps the specimen intact. These are just some of the examples from a fossil festival that places museum collections, curators, and scientists at the forefront of the visitors’ experience. The festival clearly exposes the past, present, and future use of collections and current scientific research. It also continues to remind us of the amazing scientific discoveries of people like Mary Anning and William Smith, to inspire future generations of scientists, geologists, naturalists, and artists. Long may it continue!